A reportret is a reconstructed portrait, or a portrait that goes back in time. In many cases a contemporary image of a specific personality from world history is not on hand. In order to still form a clear picture of those personages affected, Reportret was set up as a gallery of reconstructed portraits: without anachronisms, respecting contemporary style, and based on historical sources. Discover the story behind Reportret on this page or go straight to the gallery page. Last modified: 5 November 2017. This translation: As English is not my native language (Dutch is), please report any detected misspelling, grammatical error, or incorrect use of words. A German translation is also available. Frequently a contemporary portrait (painting, drawing, manuscript illumination, relief, sculpture, or photograph) of a particular historical figure is not available. As a result, non-contemporary portraits — sometimes originating from many centuries after — are often used as illustration material in publications concerning this personage. This practice has a downside. These images were almost without exception made in a style that goes with the time and circumstances of the creator, not of the portrayed. This distorts the image of the person concerned. For example: Charlemagne. There's no knowledge of any contemporary portrait of this king–emperor from the early Middle Ages. Though he has been portrayed many times in the centuries after his death, these portraits were generally produced in a style from the high or late Middle Ages. And the differences between the early (‘dark’), high (‘Romanesque’), and late (‘Gothic’) Middle Ages are substantial! Moreover, in these pictures Charlemagne was mostly depicted with dress and hairstyle from the high or late Middle Ages and surrounded by architecture, pieces of furniture, or other objects from those times. In short: the image doesn't suit who he really was. Fortunately, in recent centuries artists acquired more historical awareness. They did try to avoid anachronisms. But even their portraits contain style characteristics that can be identified as ‘Neo-Classicism’, ‘Romanticism’, ‘Art Nouveau’, or as modern photographic realism. It's still hard to form a picture of Charlemagne in which he could have recognized himself. Contemporary image culture can make a portrait more expressive. By eluding every anachronism — anachronisms in the way of depicting as well — it's possible to produce a clearer image of the portrayed. If a contemporary portrait is missing, why not reconstruct it? Reportret was set up as a collection of reconstructions of missing (destroyed, lost, unknown, or never made) portraits of historical key figures. Each reconstructed portrait intents to put the historical person in a new perspective. Because the person in question has previously been depicted so many times so differently, his or her widespread image will be a confusing one for numerous people. The new portrait should clarify that image: a portrait that comes close to reality, because it contains as few anachronisms as possible and because it was created with as much consideration for contemporary style and image culture as possible. Sometimes even local and indigenous style must be considered. Of course, resemblance is a substantial feature of any portrait. The reconstruction should at least suggest, on the basis of actual information, what the person concerned could have looked like. Clothing, hairstyle and general build must approach life — as far as contemporary image culture permits displaying realistic details. Nevertheless, it's impossible to remodel the exact facial features. The main goal is to reconstruct the portrait that a contemporary artist could have made. Whether or not it ought to be truly life-like depends on contemporary standards. Often that turns out to be of less importance. When an archaeological excavation uncovers the foundations of a building, in most cases a reconstruction of that building is drawn. Then, instead of the originally dug up plan, this reconstruction appears as illustration material in various publications. A reconstruction sparks the imagination. Any reconstructed portrait from this gallery should have the very same function: to spark the imagination and — at best — to show something of the spirit of the age and something of the nature of the depicted person. The objective is ambitious. It's an illusion to believe it's possible to entirely free a reconstruction from the date it was actually created. Nevertheless, the starting point of Reportret consists of that intention. Each portrait is displayed on its own individual page. The portrayed is always shown at full-length, to make the image as complete as possible. His or her role in history is discussed very briefly. The way in which the new portrait was reconstructed, which sources were consulted, and which assessments were made, is described in full extent. The page has a reference to the used sources and a reference to a larger version of the portrait. To denote years or centuries the terms ‘common era’ (ce) and ‘before the common era’ (bce) are used here. These terms are non-religious and culturally neutral, whereas ad (= Anno Domini = ‘in the year of our Lord’) and bc (= ‘Before Christ’), still often used in English, are terms with a undesirable Christian charge (certainly because the birth of Christ, in 6 bce, can't be the actual point of reference). ‘Common’ era stands for the now world wide most commonly used system for counting years. That's the Gregorian calendar with the point of reference that Dionysius Exiguus picked for arithmetical reasons. The genealogical symbols * (asterisk) and † (dagger, not to be mistaken for a Christian cross) respectively denote a year of birth and a year of death. With intent, the portraits were not artificially aged, with faded colours, damages, stains, or crackle. Ageing is in fact an anachronism in itself. Therefore, the portraits look brand-new. After all, they aren't forgeries, but reconstructions. They appear like they would have appeared at the time. Technique and material weren't imitated either. These were only considered where they strongly influenced, or even determined, specific style characteristics. All portraits have been gathered on the gallery page. New portraits are added very irregularly. All portraits published here are subject to copyright. Consequently they may not be reproduced or inserted in productions of ones own, unless for private use only. © MMIII–MMXVII Marco Bakker. All rights reserved. None of the images and texts on the individual pages of this website may be reproduced, stored, transmitted, distributed, or published in any form or by any means, without prior written consent. It's possible though — certainly when educational purposes are involved — to make use of some images or texts, but only after agreeing on a fair compensation. In case of a request like this, please get in touch. Note that the portraits can be delivered in nearly all desired formats, sizes, and resolutions. October 2017 — The web site was made fit for high resolution displays. This forced me to take up the forgeries once more. The portrait of Njinga Mbande was slightly adjusted as well. February 2012 — Joan of Arc had been the only woman in this gallery for many years. She's now joined by Njinga Mbande, whose reconstructed portrait plunged me deeply into African history and art. The 14th portrait thereby became reality. Besides, the forgeries were renewed. January 2012 — A lot has changed! First of all, I completely overhauled the design. The ambience and structure remain the same and accessibility is still a high priority, but I properly reworked the graphic display. The old design had really become obsolete. Some parts of the texts were changed as well. Unfortunately, I had to remove all deep links to specific external images or texts. It had become impossible to keep up with the amount of ‘link rot’, even with deep links to official websites. I also had to simplify the descriptions on the links page. Because of new insights, two portraits were entirely redrawn: Columbus and Vercingetorix. The first is no longer a drawing, but a woodcut. The new design of the second now lacks the conceived colours. Finally, in some other portraits, I've modified details that had annoyed me for years. October 2010 — I've corrected a few errors in the German translation. Many thanks to those who were so kind to point them out! The design was changed to meet the currently evermore common wide screens, but it is still backward compatible and the look and feel are as before. September 2008 — An entirely new portrait! Hannibal enters the gallery as 13th reconstructed portrait. February 2008 — I've checked and updated all external links manually. And that was highly necessary. The portrait of Christopher Columbus needed to be more true to life and was therefore completely redrawn. January 2008 — The German translation was finished! 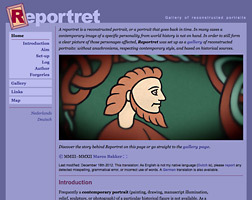 October 2007 — After a dormant existence of more than a year work on Reportret is continuing! 10 of the 12 portraits have now been translated into German. April 2006 — I've improved the portrait of Willibrord. The German translation precedes well: another 5 portraits to attend to. December 2005 — I've started a German translation. August 2005 — In spite of the large amount of already existing portraits of Christopher Columbus, I've made another portrait — and this time without anachronisms. It's remarkable how many errors and inconsistencies keep on turning up when rereading and comparing the English and Dutch texts. Most of them were fixed. May 2005 — Next in line is the portrait of Vercingetorix. March 2005 — The reconstructed portrait of Willibrord was (finally) finished. 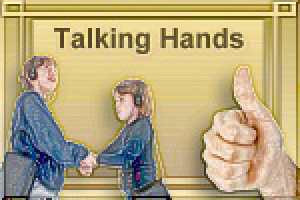 December 2004 — Unexpectedly, Reportret received the Talking Hands Award (Gold Edition) on December 7th 2004, after being reviewed by a panel of international judges. The purpose of this award is “to reward website authors, who — through their creative excellence — provide a website that teaches, contains teaching elements in sufficient detail, and otherwise leaves a visitor with something of significant value after returning to their normal daily activities”, all with usability and accessibility in mind. Many thanks to those who nominated Reportret for this award! November 2004 — I've completely redrawn the portrait of Joan of Arc. October 2004 — I celebrate Reportret's 1st anniversary with the addition of the reconstructed portrait of Laozi. The style sheets were slightly adjusted to be fully compliant with nn7. July–September 2004 — After a constructive discussion with some Muslims I've added a statement concerning the Muhammad portrait. Other adjustments aren't worth mentioning. June 2004 — Next in line is the reconstructed portrait of Muhammad (despite his warning to all creative mortals). May 2004 — Most recent addition is the portrait of Jesus of Nazareth. April 2004 — The portrait of Herodotos was added, I've updated the page with links, and I've modified the design to compensate for some flaws of Opera 6. Some forgeries were added too, because it's fun te make them, but also to illustrate how they differ from reconstructions. March 2004 — I've provided the source code with values (lang="…") to define the proper language of all parts of the texts. Though only few user agents support the special style sheet that makes those values visible with colour (in fact nn6, Safari, and Opera 6 do support it), it may be usefull to some. February 2004 — The portrait of Leif Ericsson was added to the gallery. Besides, I've enhanced all portraits and renewed the group portrait. January 2004 — I've made minor changes in the texts and improved some images. December 2003 — Some texts were modified and I was able to add the portraits of Attila the Hun and Joan of Arc. November 2003 — I've added the portrait of Motecuhzoma Xocoyotzin and the design was adjusted to solve some problems that occurred with ie6 and nn6. October 2003 — Reportret goes online with the first reconstructed portrait: Charlemagne. 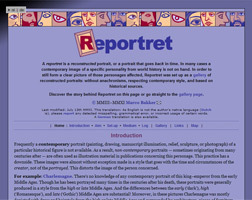 August 2003 — From my dissatisfaction with the deficiency of good illustration material the concept of the website Reportret was born.